Spotlight triumphed over the Revenant at the Academy Awards, and despite its somewhat weak win (only two Oscars, total), it was the safest movie for the Academy. Spotlight peaked a bit early after Toronto and wasn’t strong enough to win all the precursor awards along the way. But in t he end, the win for The Revenant just did not feel right - the movie was disliked by many, and in a preferential ballot that is doomsday. Yes, I picked The Revenant - the safe choice - in my Oscar ballot. But when you look back, the fact that it lost Best Picture should not be that surprising. No movie by the same director has ever won in back-to-back years. Ever. Still, Alejandro González Iñárritu became only the third person to win Best Director in back-to-back years, something that has not happened since the 1950s. Something that also hasn’t happened since the 1950s - a movie winning only two Oscars and winning Best Picture (The Greatest Show on Earth did it in 1950). The obvious reason why Spotlight won was the preferential ballot. Spotlight was a movie that was well admired and well respected - no one that saw Spotlight disliked it. The Revenant could not claim that. The Revenant may have come in with more number one votes in the first round but when the second and third place votes were counted, it was obvious that Spotlight would come out on top. The biggest mystery of the year will always be why Spotlight did not win the Producers Guild, which went to The Big Short, which also has a preferential ballot. My best explanation for that is the cycle of the season. As I said above, Spotlight peaked early and people had second thoughts - The Big Short caught fire just was the Producers were voting. But in the end, The Big Short confused some people and was perhaps even too political. Spotlight is a movie everyone can get behind - it was muted and not overstated, talks about an important issue and features heroes of a dying profession. 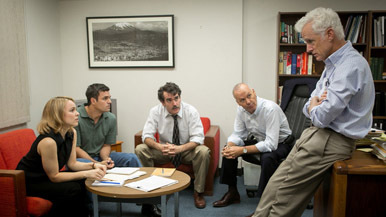 It is the first movie about journalism to win Best Picture.